The 83 bus route starts in Millhouses and Ecclesall where female life expectancy is 86.3 years. In 40 minutes, the bus wends its way to Burngreave, where women are living 76.9 years – nearly 10 years less than at the beginning of the journey. This startling observation occurs in ‘Making Sheffield Fairer: The Report of the Sheffield Fairness Commission’, illustrating the point that Sheffield is one of the most geographically divided cities in the country. 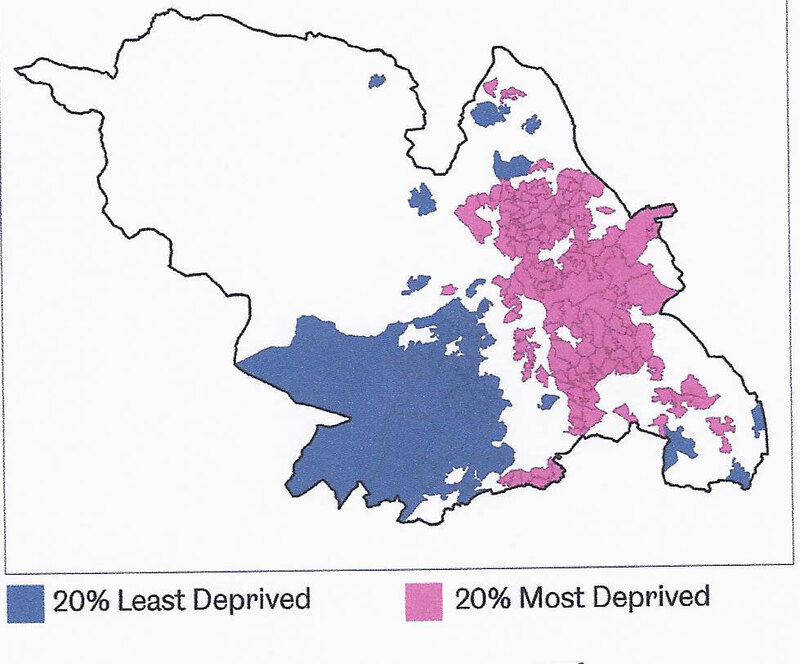 The map shows the contrast between the blue in the South West (among the 20% least deprived areas in the country) and the red in the North East of Sheffield (among the 20% most deprived areas). The Commission was set up in February 2012 by the Council ‘to make a non-partisan strategic assessment of the nature, causes, extent and impact of inequalities in the city and to make recommendations for tackling them’. The Chair was Alan Walker, Professor of Social Policy at Sheffield University, and included Bishop Steven and Cllr Jillian Creasy of Broomhall among its members. The Commission concludes ‘that there are deep and persistent inequalities between different communities and groups of people and almost a quarter of children in the city are born into relative poverty. In short, Sheffield is not a fair city where all of its citizens can make most of the opportunities it has to offer.’ And the situation is getting worse. Welfare reform means that £180 million less money will be coming to the poorer people in the city. Introduce 20mph speed limit on all Sheffield’s residential roads. On 30 January I attended a meeting of faith communities representatives with Commissioners. The Chair, Alan Walker, wanted an ‘open continuous campaign for fairness in the city’, with annual monitoring to assess progress. He saw much common ground between faith communities and the Commission and urged us to become ambassadors for the Report. I like the Commission’s bold vision and its far-reaching recommendations. However, I see two problems. First, this Report represents the consensus of ‘progressive circles’ in Sheffield. But this ethos is far removed from that of the present Government, who are greatly reducing local government spending and who, in many areas of public policy, may be taking a quite different line from that recommended in this report. The Commission’s agenda will have to be pushed through whatever cracks there are in Government policy. Secondly, there is a mountain to climb in terms of apathy and cynicism in Sheffield. Most people in the city have not even heard of the Fairness Commission. I suspect that, if told about it, some will see its ideas as impossible dreams. Commissioners promoting the report on BBC Radio Sheffield encountered some cynical reactions from those phoning in. Moreover, ideas like introducing enhanced speed limits will meet some strenuous opposition. This is a guest post by David Price, a member of the local Church Action on Poverty group in Sheffield. This entry was posted in Close the Gap, Local groups by Church Action on Poverty. Bookmark the permalink. Disappointing the journey ended at Burngreave and did not enter the North of the city where there is really ingrained poverty of multiple generations – but that wouldn’t give the fairness commission the warm fuzzy feeling they get from their attempt at stating the ‘bleeding’ obvious. Mick, the article and the Commission do make reference to the most deprived areas of the city (see the map above). Do you have any comments on the specific recommendations or other content of the report?